This is one of my favorite stamps and not so surprisingly, one of my students favorites as well. It’s called Dragonfly Legend and it’s from Stamper’s Anonymous. I find a lot of my favorite stamps are from this company. My favorite way to use Dragonfly Legend is to over-stamp a pretty background. I’ve used it over backgrounds made with Ranger’s Distress Inks and Tim Holtz’ wrinkle-free distress technique. I’ve also made colorful backgrounds with Ranger’s Adirondack Alcohol Inks on glossy cardstock and stamped it on there. This particular card, however, is made using Creative Imagination’s Radiant Rain dabbers on glossy cardstock. I really like the way the Radiant Rain colors mix and swirl when spritzing with water or Ink Potion no. 9 from Tsukineko. The colors also have a lot of shimmer to them. I especially love the threads of metallic color you get when adding gold or bronze. 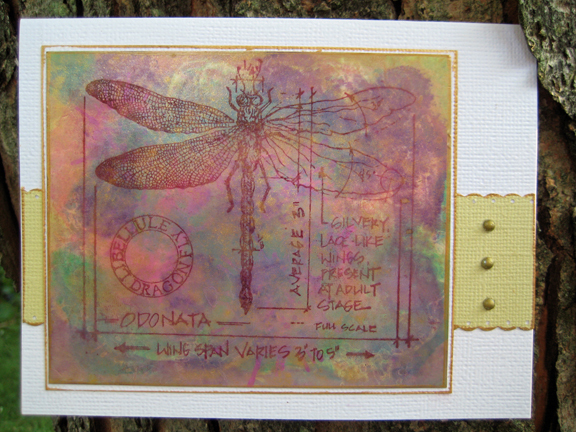 I over-stamped the Dragonfly Image using Ranger’s Archival Ink which is waterproof and sets well when heat set, then edged with Ranger Gold Paint Dabber. Students in my upcoming Collection of Cards class at Scrapbook Peddler in Saginaw will get a chance to play with the Radiant Rain dabbers when making this card. I hit enter too soon. I hope you offer this class again, I will be out of town when you have it scheduled. I love this stamp too.